George Brown : Surf-riding in Samoa, 1870.
their life-histories described and compared. Macmillan and Co., London, 1910. 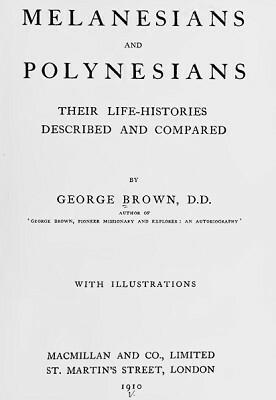 Brown resided in Samoa from 1860 to 1874, his account of surf-riding dated approximately as 1870. He also recorded a traditional Samoan legend where Ulufanuasesee was always gliding on the surf at Mauu. George Brown, D.D. Pioneer-missionary and explorer, an autobiography, a narrative of forty-eight years' residence and travel in Samoa, New Britain, New Ireland, New Guinea and the Solomon Islands. Charles H. Kelly, London, [1908? ], page 125 and page 130. My acquaintance with the natives of the East and West Pacific extends over a term of forty-eight years. During that time I resided in Samoa for fourteen years continuously, from 1860 to 1874, and I have often visited the group in later years. In 1875 I landed in New Britain, now named the Bismarck Archipelago. At that time there was no white man living in the group, and practically nothing was known of those islands or of the people living there. group on several occasions since that time. Diving Sports at Ruviana, Solomon Islands. At all events, the principal preparation in Samoa for a young man taking his part as an adult was that he should be tattooed. to have come from Fiji. the story of the origin of the goddesses who were worshipped by the tattooers as the presiding deities of their craft. After that the woman (Papa) was with child, and brought forth a son, called Ulufanuasesee. His father, the chief Aeasisifo, was of the conquered party. Aeasasae was of the victorious party. Aeasisifo was trodden down, so Ulufanuasesee ran away, because his father Aeasisifo was conquered. Ulufanuasesee ran to Falelatai and dwelt in the mountain and was settled there. Ulufanuasesee was always gliding on the surf at Mauu. That was his employment, to glide on the waves. He saw the waves of Fagaiofu were breaking, so he went there to glide on them. He left his ti-leaf girdle and the band of his head-dress on the beach while he was gliding on the surf. A lady called Sinalalofutu and her maidens came to the place. The lady saw Ulufanuasesee and she wished to have him for her husband. 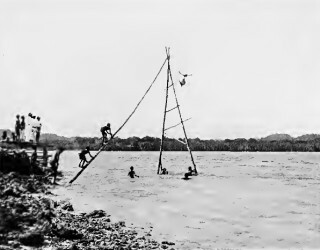 The Samoans were not very fond of foot-racing or leaping, but canoe- and boat-racing were very popular ; in fact, no two canoes or boats could be long together without having a race. Swimming is an acquired art, but is learned very early in life. A mother will take her child into the water when quite young, and the child very soon begins to swim. Some of the bush people, it is said, do not know how to swim. but I have never seen a Samoan who could not do so. They always swim with the side stroke, and when making a spurt they often throw both arms out of the water alternately. They are able to swim great distances. I have known of a woman who was running away from her husband who swam from Apolima to Savaii, some seven miles. They are good divers, and can remain some time under water. A favourite sport in rough weather was that of surf-riding (faasee). This was sometimes done in canoes just inside the reef. The occupant waited until a suitable roller came, on which the canoe was shot with great speed for a considerable distance. At one place where I often stayed I witnessed some exciting surf-riding by the natives of that town, who were celebrated for their proficiency in the art. The shore consisted of immense boulders, on which the waves dashed in stormy weather with great violence. great speed to the beach, shouting out a peculiar cry with great glee. Just before the wave dashed on the boulders, they would turn somersault and dive into the surf, and swim out again to repeat the process. They were very proud of the fact that they never used a surf-board in those dangerous breakers. They kept themselves in the crest of the waves by a backward or forward movement of their hands. Children would practise this surf-riding on a board inside the lagoon. Geoff Cater (2017) : George Brown : Surf-riding in Samoa, 1870.